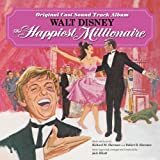 There are those – Paroles de la chanson dans “Le plus heureux des milliardaires”. Interprétée par Tommy Steele, Geraldine Page et Gladys Cooper. There are those whose social standing. Every single thing we do the public knows. Then there is a lower strata. I suppose. There are those, there are those. There are those to whom position. To be worn with ease like comfortable old clothes. Though the nouveau riche deny it. All their money cannot buy it. Class will out. Goodness knows but there are those. Watercress on toast, ma’am ? There are those who grace the pages of the blue book. Never heard of it. Is it a new book ? Certainly anyone who is anyone is listed. Oh, you mean the New York Telephone Directory. There are those whose names predate the constitution. Yes, and some of them opposed the revolution. Cream cheese and cucumber ? Philadelphia is the cradle of liberty. Smoldering like an aging page of history. There are those who flaunt posterity. There are those who flaunt austerity. Posing cozy on the rosy status quo. Poison dart, I mean raisin tart. There are those quite influential. There are those quite inconsequential.